Curated from Hanna Karlzon's bestselling coloring book, Daydreams Artist's Edition is a gorgeous collection of finely-drawn fledglings, a sleeping fox, an exquisite owl, eclectic insects, and more. Daydreams Artist's Edition contains 20, single-sided illustrations on oversized art card paper, perfect for expert and budding artists alike. 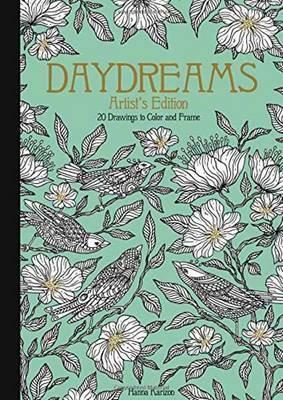 Add to your collection with Daydreams Coloring Book, the hardbound, 96-page edition, or Daydreams. Also available from Hanna Karlzon is the Summer Nights Coloring Book and Magical Dawn Coloring Book. Let your imagination roam (inside or outside the lines)! Hanna Karlzon is an Umeå, Sweden-based illustrator and creator of the best-selling coloring books, Dagdrömmar and Sommarnatt, previously published in Sweden. She creates elaborately detailed images using India ink to detail pictures from her own imagination and loves to draw flowers, forests, houses, and animals. She draws her inspiration from the natural world that surrounds her studio in northern Sweden and adds in some art nouveau, punk rock, and often a hint of '70s design to the mix.